This issue of ReNew cheers on Australian-made research and production with an eye toward sustainability. We also look at strawbale building workshops and case studies of people who love their houses ‘built of straw’. We explore the important issue of keeping textiles out of landfill and cover ways to reconnect with nature in the city. 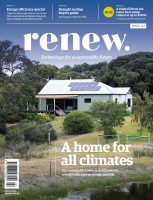 ReNew 136 highlights a world-first trial of a household battery system network on Bruny Island and how forecasting of both energy usage and the weather can improve battery economics. You’ll also find tips on what to consider to ensure you buy or build the most efficient computer possible, as well as an update on our popular eco-paints buyers guide. Finally, we report on the very exciting project just completed by the ATA where we helped advise and connect a remote Aboriginal community with investors to install a 36kW solar system offsetting about 10 tonnes of CO2 each year. Plus lots more! SKU: R136. Category: Renew. Tags: australian, ReNew, strawbale. 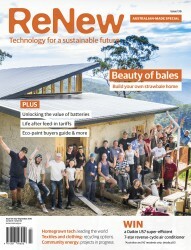 Issue 136 is hot off the press and full of advice for your sustainable home. As always, ReNew comes overflowing with articles to satisfy both the technically and the not-so-technically minded. 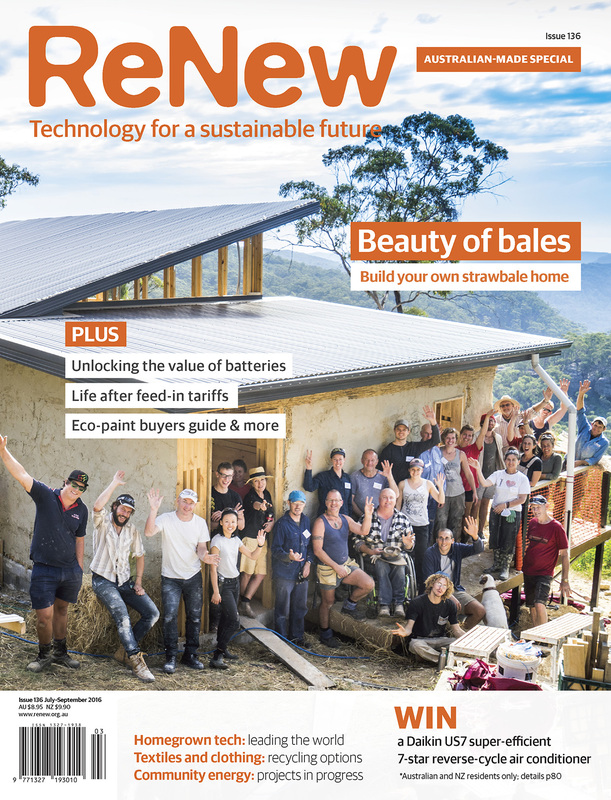 Regardless of whether your interest is building with strawbales, finding out what to do when your solar feed-in tariff expires or buying eco-paints, there is something for everyone in this issue. Innovation equals change for good, says Geoff Andrews. He reviews Australia’s performance in sustainability and suggests improvements. ATA member Trevor Berrill gives a personal take on the slow emergence of renewables as an industry in Australia. A slice of history: the first grid-connected solar home in Australia. ANU’s Andrew Blakers on PERCs, heliostats and PV quality: Australian technologies leading the world. How forecasting of both energy usage and the weather can improve battery economics: IBM Research’s Julian de Hoog and Khalid Abdulla. Household battery systems will become active network agents in a world-first trial on Bruny Island, ANU’s Evan Franklin explains. Community energy is growing fast! Jarra Hicks and Franziska Mey of Community Power Agency report on the many projects taking off and some of the remaining barriers. A remote Aboriginal community and investors came together to cut bills, reduce emissions—and generate investment returns. Interviews with four architects on the history and future of sustainable home architecture in Australia. Peter Smyth on the advantages of prefab and where it’s headed in Australia. Paints have become more eco-friendly, but there are still traps to look out for, Daniel Wurm explains. Plus ReNew compiles a table of natural paint suppliers. Colin Dedman tests the latest generation of lithium-ion cordless leaf blowers. You don’t need to waste energy to get all the computing power you need. Lance Turner surveys the field of low-energy computing. For those wanting to build with strawbales, there are many workshops that can help, from theory through to hands-on building experience. Enga Lokey explores the options. Three owner-builders share how workshops helped their strawbale build. With feed-in tariffs about to drop dramatically for many, ATA’s energy analysts Damien Moyse and Nick Carrazzo discuss six steps to consider. Sarah Coles explores the benefits of diverting textiles from the waste stream and takes inspiration from the Japanese practice of maintaining clothing for a lifetime. Claire Dunn explores simple ways to reconnect with nature via urban ‘rewilding’. Long-time ATA member and software engineer Rod Scott continues to expand the work of Selectronic, his family business which 35 years ago created Australia’s first inverter. He talks to Kulja Coulston.